That’s a big pen in that box! Not all the advertisements that come my way have a date on them. In this case, because there’s no actual pen in the advert., dating matters a little less. All the same, I would like to know, but I’m hopeless on dating fashions. However, overleaf there’s a picture of a woman in a cloche hat. Wikipedia, that refuge of the lazy and the none too critical, tells me the cloche hat was invented in 1908, became especially popular in the 1920s and continued to be worn until about 1933. Doesn’t exactly pinpoint it, does it? A little bit of googling around tells me that though the 1920s was the period of the flappers and their short dresses, that was evening wear. Day time dresses were much longer – the hem at ankle level. Because of the swirl of holly around her feet, the Swan girl’s hemline isn’t really visible. Early 1920s, then? It’s possible that it’s Edwardian, though. 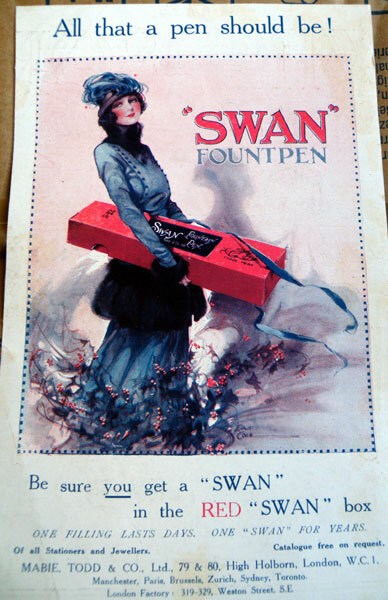 There’s no mention either of the Great War or of the period of recovery after it, as there is in Swan adverts of those times, so it’s fair to assume that if it’s not as late as the early twenties, it’s before the war. I dunno. Maybe you do. I just wish the people I buy these things from would take note of the date of the magazines they cut them out of. That is a nice ad.You r use of the cloche hat to help date the ad is neat. The ad could be from any magazine isn’t it? Eevn outside the UK. A check on google shows Swan/M&T ads appeared regularly for instance in the Wanganui Chronicle in NZ. The M&T address shows it is after 1905(or is it after 1906?). They were based at Cheapside earlier than that, right? Does the use of the wword “Fountpen” help with narrowing the dates at all. “Fountpen” doesn’t help unfortunately. It was an early term which Swan continued to use for a couple of decades. I suspect it will have been from a British paper. The seller it came from seems to have an endless supply of magazines like Punch and The Graphic. Where dating becomes more important is on the occasion of the announcement of a new range of pens or a technical innovation like the ladder feed. I know the pens so well that I can date the adverts by the pens, rather than the other way round, but that’s dangerous – you can get into a cycle of error that way. An advert that shows the then current pens and has a date on the masthead is good primary evidence. I’m sure someone with some knowledge of fashion history would nail this to the month, but that’s not me.